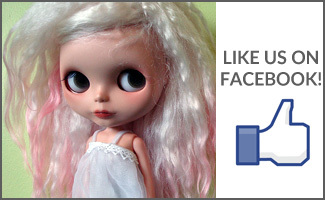 The age old question is frequently asked in the doll community: Do you prefer stock dolls or customized dolls? For a very long time, I only ever had stock dolls. Most people barely consider a gaze lift or eye chip changes to be a ‘customization’ anymore, that is how common it has become – and yet it’s still the bulk of the customization that I can bring myself to do. While the idea of holding a melted glue stick to a very expensive doll originally made me incredibly nervous, the fact that I can do it without issue now is a nothing short of amazing in my book. Some people were meant to be customizers, I am not one of those people. Halo (wearing Kult of Kulta) and Cameo (wearing Plastic Fashion), both customs by Friends With Blythe. That isn’t to say that I cannot enjoy customized dolls. 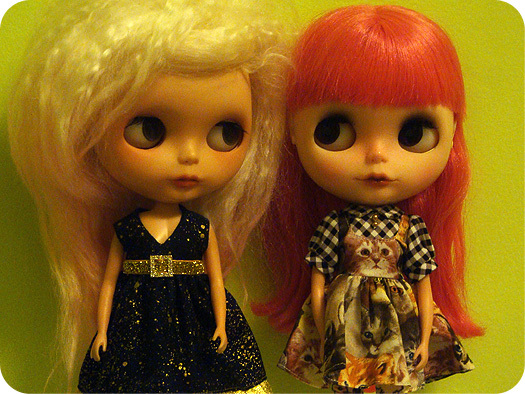 I have two customized lovelies, both by the same customizer (Friends With Blythe). They definitely do have something different than my (more) stock dolls. From the carving to the face-up and, let’s be honest, it’s nice to have a not-so-shiny doll face looking at me all the time. My custom dolls are the only ones that I have a non-stock Kenner or Takara body, they came to me on Licca bodies and on Licca bodies they shall stay. Primrose (Kenner) wearing Luxie Lou. While there are many people who have high preferences for custom dolls (and I even know a few people who are physically incapable of leaving a doll in their presence stock! ), I love stock dolls. There’s just something about them that I adore. Maybe it is the shiny forehead, or the fact that the way the arms stick out make me smile. 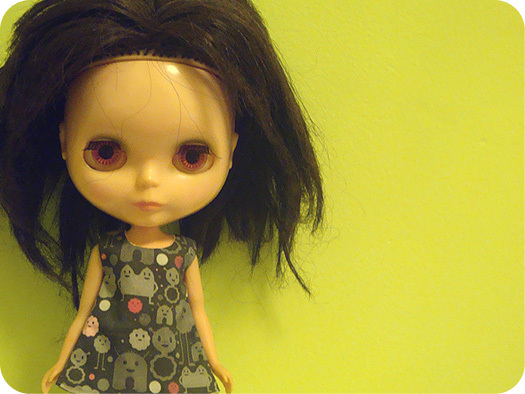 Then again, maybe it’s because I fell in love with Blythe initially because of photos of stock dolls and I wasn’t that into custom dolls to begin with. 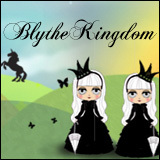 Stock dolls truly represent Blythe to me – be in vintage or modern releases. There are many beautiful new releases lately that some people have likened to already being customized (hello, stock matte faces…) and yet, as beautiful as they are (and I would love to add one or two to my collection some day), there is just something so charming about having a shiny face staring back at you, quietly judging you for your own outfit choices when you’re dressing them in an dress that costs more than your entire outfit. Or maybe that’s just how I feel. Maybe I should start spending more money on me instead? Just a thought. 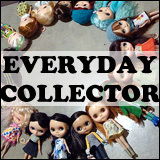 Nah, all the monies go towards dolls. Dolls, dolls, dolls. And more doll things. QOTW: Is Your Family More Stock or Custom? Question of the Week: Stock Shine or Matte?